Congress unveiled a massive $1 trillion omnibus spending package on Tuesday, in the hopes of funding the government through Sept 2015. The bill, referred to as the "Cromnibus" for "continuing resolution plus omnibus," would help the government avoid a shutdown. But if it passes as it's written now, an iconic American bird stands to lose a lot of ground: the sage-grouse. A provision in the proposed spending bill would bar the U.S. Fish and Wildlife Service (USFWS) from listing the greater sage-grouse as endangered or threatened. The agency would have to wait until after September 2015 to put protections in place for the species. It would also prevent USFWS from protecting for the Gunnison sage-grouse - a species that was listed as threatened last month. (Their status could be revoked.) Under the new bill, the Department of the Interior would not be able to propose Endangered Species Act protections for the two species. 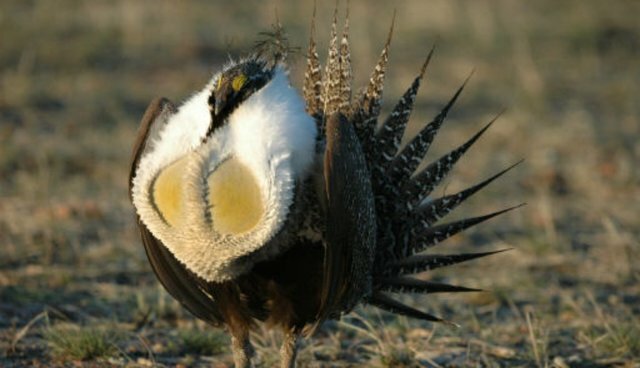 The provision has been seen as a victory for oil and gas companies, which have been seeking to expand into the sage-grouse's habitat, which spans across many western states. The industry has previously fought back against protections for these birds in particular, arguing that they will interfere with oil and gas extraction. Conservationists have voiced their opposition to the statement. "The priority right now is to get science-based, state-level conservation plans in place that are effective enough to avoid a federal listing for the Greater Sage-Grouse in the first place," Brian Rutledge, vice president of the Audubon Society, said in a statement. "This rider will only complicate coordination between the BLM and statehouses and stems entirely from political chicanery, ignoring scientific input and voices across the Mountain West that want strong plans in place." Reuters reports that the bill is expected to be brought before the House of Representatives on Thursday, followed by the Senate.